The Element Jacket from EzyDog is a jacket for dogs. Thanks to the fleece lining, the jacket is suitable for all seasons and is wind and rain-resistant. The EzyDog Element Jacket helps protect your dog from the elements. 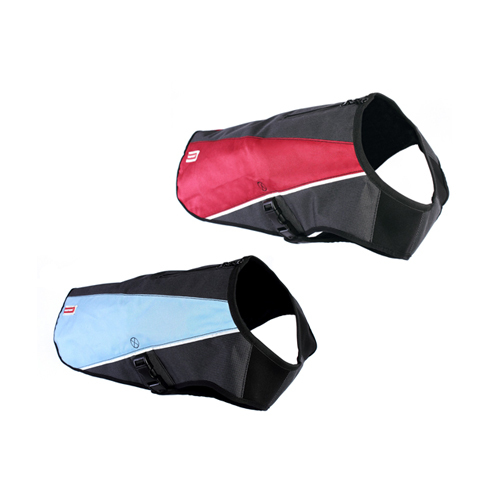 The fleece lining keeps your dog warm in cold weather and cool in warm weather. The outer layer is made of 600 denier Ripstop. This method of weaving ensures that the jacket protects your dog from wind and rain. The Element Jacket has a waterproof zip at the top. Below the zip is a point where you can attach a lead. Thanks to the flap under the chest and the synthetic clasps on the side, the jacket will also stay securely in place during walks. You can use the EzyDog Element Jacket in combination with the leashes from EzyDog. Which EzyDog Element Jacket will fit my dog? How do I put the EzyDog Element Jacket on my dog? Pull the jacket over your dog's head and pull the chest flap between the front legs to cover the stomach. Then fasten the synthetic clasps on the side of the jacket. For a good fit, you can adjust the straps of the clasps. Below the zip at the top is a point where you can attach a lead. The EzyDog Element Jacket is available in red and blue. What if the Ezydog Element Jacket is not right for your dog? The Ezydog Element Jacket can be removed from the packaging and held up next to your dog in order to check whether it fits. For hygiene reasons, the jacket cannot be returned if it has come into contact with your pet. If we find that the returned Ezydog Element Jacket is stained, worn, contains dog hair, smells or has been washed after use, we cannot return the product to you. In this event, it will be donated to a charity (local shelter). As we are often confronted with products that are returned in a less than new condition, we have to apply these rules for returning products. Have you used EzyDog Element Jacket before? Let us know what you think about this product.